“Durable” means the power will remain in force if you become incapacitated. This can be helpful if you are injured and have to remain in a hospital for a number of weeks. Otherwise, your business operations could be put on hold. 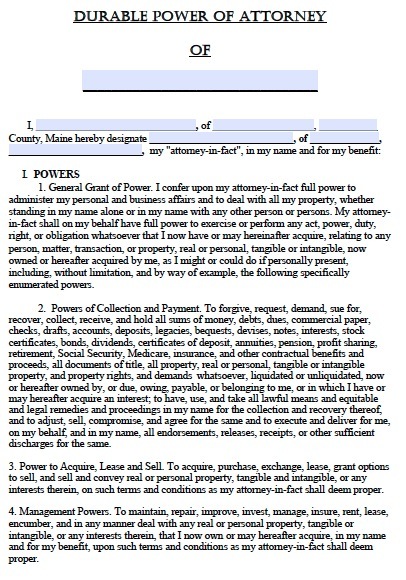 You can also draft the power of attorney so that it only lasts for a certain period. For example, if you planned on going on vacation for four weeks, you could draft the document to state that the powers will remain in force only during the dates of your absence, and specifically state those dates. This way you could have someone else handle any business that is so routine you don’t need to oversee it directly. You should be careful when choosing an agent. He or she will have great power over your funds and assets, so it is important to choose only someone you trust completely. The agent has a legal duty to act in your best interests, and you should ensure the agent understands your transactional goals and is willing to act on your behalf.